Stuchd an Lochain and Meall Buidhe are two Munro hills that overlook Loch an Daimh in a remote corner in the heart of Perthshire. 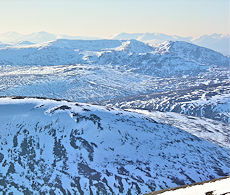 Snow transforms these hills and on fine winter days the views are vast over Rannoch to Glencoe and beyond. 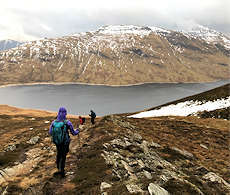 A winter's day of guided hiking over hills above Loch an Daimh. Reach superb vantage points from where vast views can be savoured, particularly towards Glencoe and Lochaber. Bag the two Munro summits of Stuchd and Lochain and Meall Buidhe. Join a small group led by an experienced leader familiar with the remote and quiet area. Your guide will know this remote and quiet corner of Perthshire well and be able to give you insight into the flora, fauna and geology. Overlooking Loch an Daimh and its dam, Stuchd an Lochain is a fine mountain with some interesting topography and summit cairn perched above a precipitous drop down a small lochan. Meall Buidhe to the north of the loch is quite different, a vast plateau above heather clad slopes with an eastern coire that remains corniced well into late spring. We start from below the dam and hike up on a fine track around the dam to a boat-house. 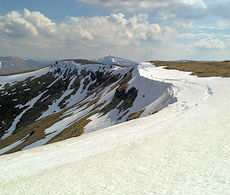 Onto a steep faint path, we'll pick up some fence-posts higher up the follow over undulating terrain up to the summit of Stuchd an Lochain (now marked as Stuc an Lochain on newer maps). Depending on conditions we can hike in a circular route around the loch over pathless ground aiming for Meall Buidhe with its fine cornice above Glas Choire. Or, for a shorter day, we can return to the dam the way we came up and then make a direct ascent of Meall Buidhe on an obvious (if rather squelchy) path. The direct routes to the Munros are on faint paths, most likely to be a bit boggy in bits lower down but better higher up. In fine conditions we class this event as a 'moderate day', with snow covering and possible winter conditions, we class this as a 'demanding day'. We are likely to encounter winter conditions on the 3 Mar'19 event and if this is the case, we ask that you come appropriately equiped. We can help with some of the necessary gear (eg ice-axe, crampons) and coach you in their use if needed. Leading the events on 3 March'19. We begin from the dam at the eastern end of Loch an Daimh, which is on an unclassified road through Glen Lyon north of Loch Tay and accessed from Aberfeldy to the east and Killin to the south, both of which are on the A827. 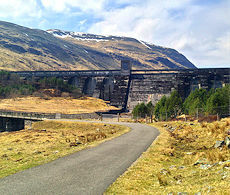 There are no reliable public transport links to the dam or in Glen Lyon.